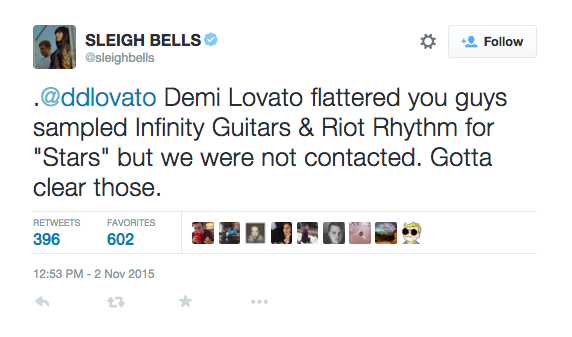 Did Demi Lovato Steal Sleigh Bells' "Infinity Guitars" for Her Track "Stars"? Demi Lovato’s album Confident dropped in October, and today Sleigh Bells have accused the pop star of sampling two of their tracks without permission. Sleigh bells, the duo of Derek Miller and Alexis Krauss, tweeted at Lovato earlier today, claiming that “Stars,” a bonus track from Confident, samples both “Infinity Guitars” from 2013 album Bitter Rivals and “Riot Rhythm” from 2010’s Treats. According to the album credits, “Stars” was written by Lovato, Rami Yacoub, Carl Falk, Savan Kotecha, and Alexander Kronlund, with Falk and Rami credited for production. Lovato has yet to respond to Sleigh Bells. Listen to Demi Lovato’s “Stars” above and the two Sleigh Bells songs in question plus their tweet below.